Most people have heard of Lisbon and Porto and the Algarve. But that’s often where their knowledge of Portugal stops… and there’s so much more! I spent two very happy years living in a city called Viseu (due west of Salamanca in Spain) and did a lot of riding in this part of Portugal’s Beira region. There’s some lovely scenery around Viseu – including the Serra da Estrela – but my favourite area was the border country with Spain right in the east. These days it’s an extremely quiet part of the world. You get the sense that not much has changed in the last few centuries. There’s very little traffic, lots of open views and some beautiful scenery. And if you like castles – which I do – you’re spoilt for choice. Dotted across the landscape are a number of small towns, often up on a hilltop and nearly all with a castle or fort to go exploring. Some are ruined, some aren’t much more than a single tower but some are simply spectacular. One of the best is Sortelha. 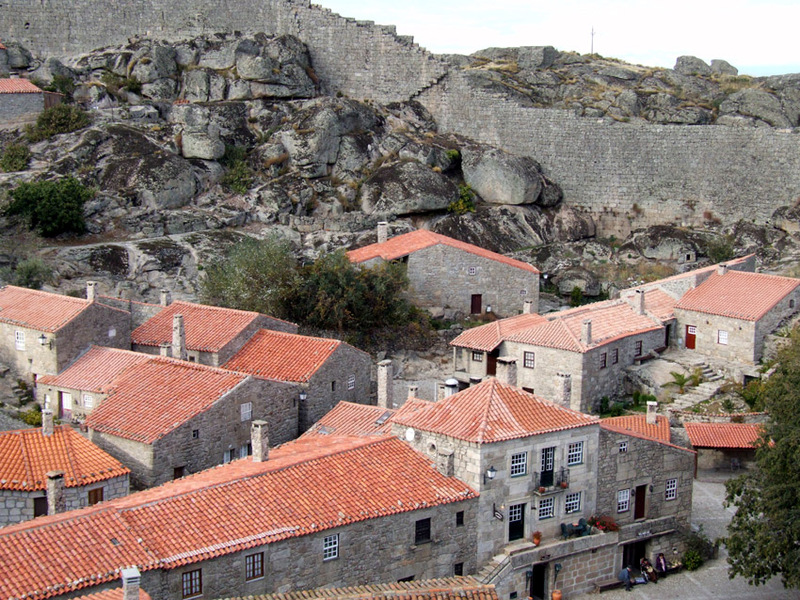 There’s a modern village on the road but just go a little bit further up the hill and a granite gateway leads you through into the cobbled streets of the old town, where the castle looks like it’s straight out of some mediaeval romance or fantasy epic. The old town is also ringed with granite battlements that climb across the hillside, almost looking as if they’ve grown out of the rock below. Walking them provides incredible views but isn’t for anyone who suffers from vertigo or nerves. One of the refreshing things (for me) about visiting many Portuguese castles is that there are no guard rails or warning signs. Unlike in the UK where we’re not trusted to think for ourselves, in Portugal you use common sense or you fall off! Anyway, I could go on for ages about Sortelha – and various other castles – but what I most want to do is to encourage you to go and visit them. Back in 2008 when I was just getting going with this site, I put together some details for a ride from Belmonte (another pretty hilltop town with a castle) to Sortelha. I’ve just revised the page and expanded the ride to include a visit to Sabugal. You can guess what the attraction is there. I know it’s Monday so if you want a distraction and an idea for somewhere else to visit in Portugal other than the usual suspects, take a look at my Fantasy Castles ride. Have a good week, Huw.